With balanced flue boilers there are clear limitations and instructions which come with the boiler concerning how the flue should be installed. The maximum length of flue varies considerably from model to model. Some need to be positioned so that the flue goes directly through the wall to the outside while others can have several metres of flue which allow the boiler or heater to be positioned on an internal wall. This particular Approved Document can serve as a pretty good guide for flue design as it covers all the main aspects which are to do with safety along with quite a few detailed construction drawings. There have been a considerable number of fires in Passivhauses with class 1 heating appliances (such as wood stoves). 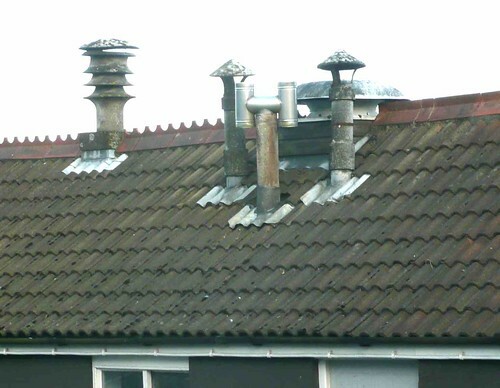 These have been attributed to heavily insulated and sealed roof areas where heat buildup has occurred, possibly due to flue fires. An article in Green Building magazine, summer 2013 describes one such very serious fire, which although the flue was twin-wall and to current building regulations. pretty much burnt the house down. A Dutch company, Metaloterm, manufacture a high grade insulated flue designed to prevent such fires.